Teenagers often turn on an iPod while playing on the computer before watching the giant plasma HD TV staring down at them from the wall. Many teens live day-to-day with comforts and amenities they never even think about. “The Unheard”, by Josh Swiller, will remind everyone how lucky he or she is to be able to dance to their music or watch TV. A page-turner to the end, “The Unheard” recounts one man’s journey to help solve the problems of a nation while finding a place for himself. 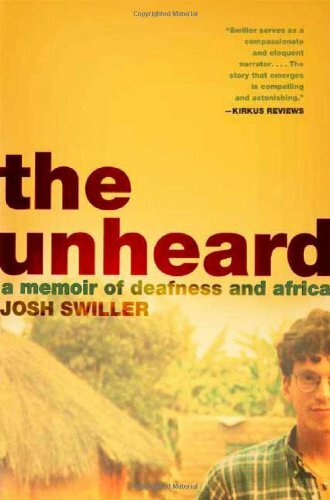 Josh Swiller is a deaf young man who cannot seem to find his place in the hearing world or in the signing world. When he takes off for Zambia as a Peace Corps volunteer he thinks that he has finally found a place where his deafness doesn’t matter. Mununga, a growing town in Zambia near the border of Zaire, is where Josh is sent. He was the first ever Peace Corps volunteer there and for most of Mununga’s inhabitants the first white person they had ever seen. Swiller connects with the kindly clinic worker Jere who soon becomes a confidant and mentor. A town bustling with activity and hope of progress is welcoming and excited about Josh and the opportunities he represented. Soon, though, the peaceful town of Mununga starts rearing its ugly head as Josh is confronted with some of the horrors of a third world nation. “The Unheard” is a startling expose of what the African nation of Zambia was going through in the mid 1990’s and the amazing differences in resources throughout the country. Described in the book is how one part of Zambia has hospitals and electricity, while Mununga’s growing population is struggling to get a clinic built to save the hundreds of malaria-ridden and starving children that come to the run-down clinic every day. The disparity between the different regions of Zambia and then the huge difference between the United State’s resources and Zambia’s is a shocking thing. Swiller is a relatable character in an unimaginable place. Set in the brush of Zambia, Swiller is attempting to complete a successful cultural exchange. If it is going to the market or weighing babies at the clinic, Swiller seems to notice everything. The town of Munungu leaps to life as the kindly Jere gives medicine or as a group of little boys play in the stream. A perfect narrator, Swiller, tells of how many people didn’t believe he is deaf because of his hearing aids and “perfect hearing.” The addition of Swiller’s deafness and search for a place of acceptance adds an interesting angle to the story. Readers are transported to a place where they too begin to understand what it is like to have the power to tune out the outside world, or where the outside world tunes them out. Swiller writes in a way that is easy to understand yet that leaves the reader with a descriptive picture in his or her head. His writing beautifully portrays each interaction or confrontation so that the reader can feel as if he or she is a townsperson watching the first white man walk through the center of Mununga drawing the stares of everyone around him. “The Unheard” is a thought-provoking book of great depth. Swiller does not sugarcoat the tough life in Zambia but instead shows the harsh realities of a developing nation. There is something new to learn or think about on every page of “The Unheard” making this book a delightful read.